The final season is here and everything has changed! While it's sad that we're beginning the end of The Legend of Korra the show has set up some intriguing—if risky—dominos for Book Four. Okay, truth time: the season premiere makes me very excited but also a wee bit nervous. Part of the reason that I absolutely adore the Avatar: The Last Airbender sequel comics (and if you haven't read them, you should) is the way they treat the post-war politics of the Earth Kingdom. There is an acknowledgement that the world is still complicated in the wake of Ozai's defeat and that Fire Nation people and their culture can't be smoothly extracted from the Fire colonies in the Earth Kingdom. And ever since the Earth Queen died in Book Three, I've been itching to see what becomes of the Earth Kingdom. And it's neat that we just left behind those agents of chaos, the Red Lotus, we have Kuvira as the avatar of order. Even her Earthbending is orderly and compact, with not a movement wasted. Kuvira wants to unite the entirety of the Earth Kingdom—even if means resorting to resource extortion. And while I can dig disagreements about Kuvira's philosophy and methods (she strikes me as a very "the ends justify the means" kind of gal), I worry about Kuvira descending into villain territory. As much as I adored the Red Lotus, they sat firmly in the villain camp, and we were all burned by Unalaq. If Kuvira is to be an antagonist (and the trailer has heavily suggested that she will be), I hope she will be a complicated, genuinely well meaning one—especially since Bolin has, for the time being, aligned himself with her. She does have Varrick and Zhu Li in her group, so at least she should prove interesting. But let's get caught up with Team Avatar. The people of Republic City have figured out not only how to coexist with their new spirit neighbors, but also how to turn them into a tourist attraction. Future Industries is thriving under Asami's leadership, and Asami is fending off come-ons from the prissy Prince Wu, soon-to-be king of the Earth Kingdom. Is there something about the current Earth Kingdom dynasty that makes them all wimps and sociopaths? Wu may not be cut out for leadership, but the United Republic's President Raiko has backed him, even giving him Mako as his utterly unwilling bodyguard. Mako carries out his bodyguard tasks in true Mako form—competently, but grudgingly. Three years have done little to mollify Mako's mope. Too bad for him, he's going to be Wu's bodyguard for the foreseeable future. The really meaty stuff, however, is happening off in the Earth Kingdom. The region is still experiencing unrest following the Earth Queen's death and the social eruption of the largely depressed Ba Sing Se. In the absence of stable leadership, bandits have thrived, disrupting the lives of ordinary citizens. Kuvira and her fiancé, Suyin's son Baatar Jr., are more than happy to stand into that leadership void, hoping to unite all the states of the Earth Kingdom under their banner. 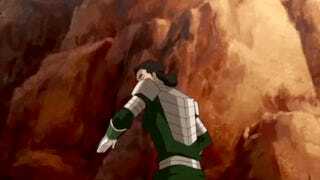 And we see first-hand what happens to people who resist Kuvira's brand of unification. Opal and Kai have settled into their roles as Air Nation helpers, running supplies to troubled regions and battling bandits along the way. It's necessary, because Kuvira, for all of her insistence on order, won't help provinces that don't join with her. In fact, Kuvira seems to be actively running a protection racket. After Kuvira intimidates a group of bandits into swearing fealty to her, a bandit steals the supplies that Opal and Kai are running to Yi, a village Kuvira is looking to unify. When Opal and Kai fail, Yi has no choice but to join with Kuvira. Twisted up in all of this is a romance (something Korra typically has trouble with) and family (something Korra typically excels at). After all, Bolin is working with Kuvira while he and Opal are still an item—although they are still at the chaste hugging stage after three years. And then there's the fact that Kuvira and Baatar Jr. apparently had a falling out with Suyin, something Opal still resents. So where is the Avatar in all this? That's what her fathers want to know. Apparently, for the last six months, Korra has been lying to both Tenzin and Tonraq, letting each one think she was with the other. Korra has been keeping a low profile since her battle with Zaheer, and most of the world seems to have warmer and fuzzier feelings toward the Avatar now that she's not in the papers every day. And while Korra may be walking again, she's not ready to act as the Avatar quite yet. Instead, she's losing herself (and just plan losing) in Earthbending MMA matches. Okay, so Korra's got issues—what else is new? But judging from the brief glimpse we get of her (and the first clip released from Book Four), these are very different issues than the ones that plagued Korra in Book Two. Book Two Korra was prideful, sheltered, pushing people away because she thought it was the only way she could come into her own. Book Four Korra seems haunted, beaten down, and perhaps she's pushing people away because she fears she's not the person everyone expects her to be. Hopefully, her journey through this darkness will put a satisfying cap on the series as a whole.